It's been five years since the last Golden Boys record. While I did listen to Dirty Fingernails quite a bit when it first came out in 2012, I can't say it's been one that I've gone back too all that often over the last few years. When I received an email alerting me that Better Than Good Times had been released, I hesitated for a moment, but decided to take the plunge and order it. I'm still looking for that blow away album of 2017. 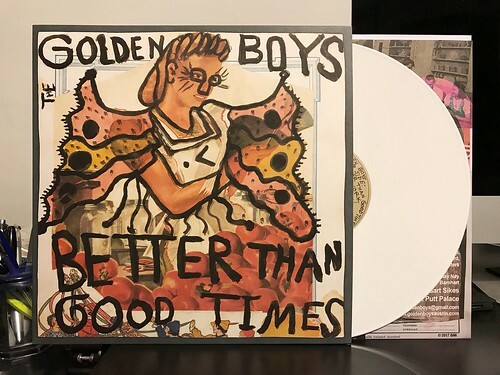 Better Than Good Times isn't it, but it's a pretty solid record and likely an improvement from Dirty Fingernails. The Golden Boys play a somewhat rustic version of electric guitar rock and roll. I wouldn't go so far as to say they lean country, but you can hear just a bit of twang and it tinges most of the songs on this record. Luckily, the songs also have pretty good pop rock hooks that help move things along and keep the album interesting to me. I think the album is most successful when the band picks up the pace like they do on "Lonely Girls" and the title track "Better Than Good Times." This is where they start sounding like prime era Goodnight Loving to me, which is always a good thing. When The Golden Boys slow things down. the songs are still pretty good, but they just don't reach the heights of the quicker ones. Better Than Good Times is good times, but I'm not sure it's better than good times. It's kind of the definition of a good, solid record. A fun listen and one I recommend checking out, but it isn't the the record I'm looking for to take over my best of 2017 list. The Blues Brothers - Rubber Biscuit 7"